When you replace a light or chandelier do you wonder what to do with the glass globes that covered the light bulb? Throwing them in the trash seems like a poor idea since they are usually in nice condition. But whatever could you do with them? 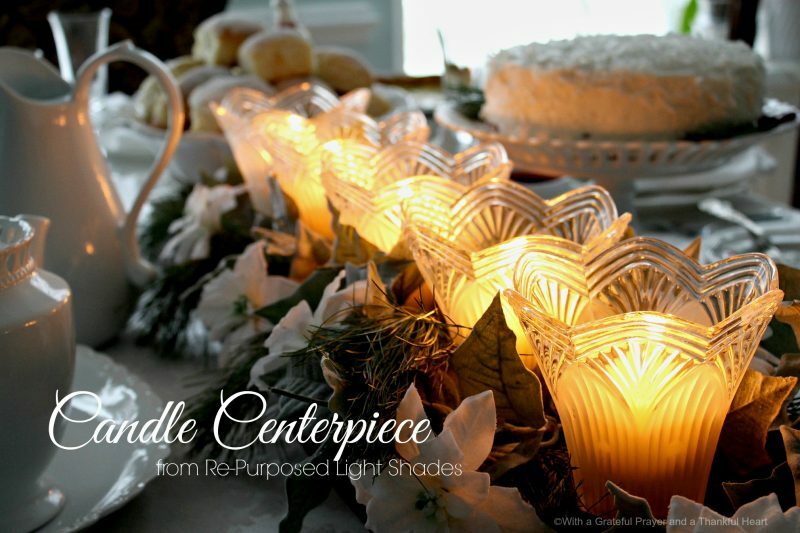 Make a beautiful table centerpiece from re-purposed light globes. With a little creativity and a few supplies you can recycle and repurpose the globes to create a centerpiece to use on your kitchen, dining room or coffee table. 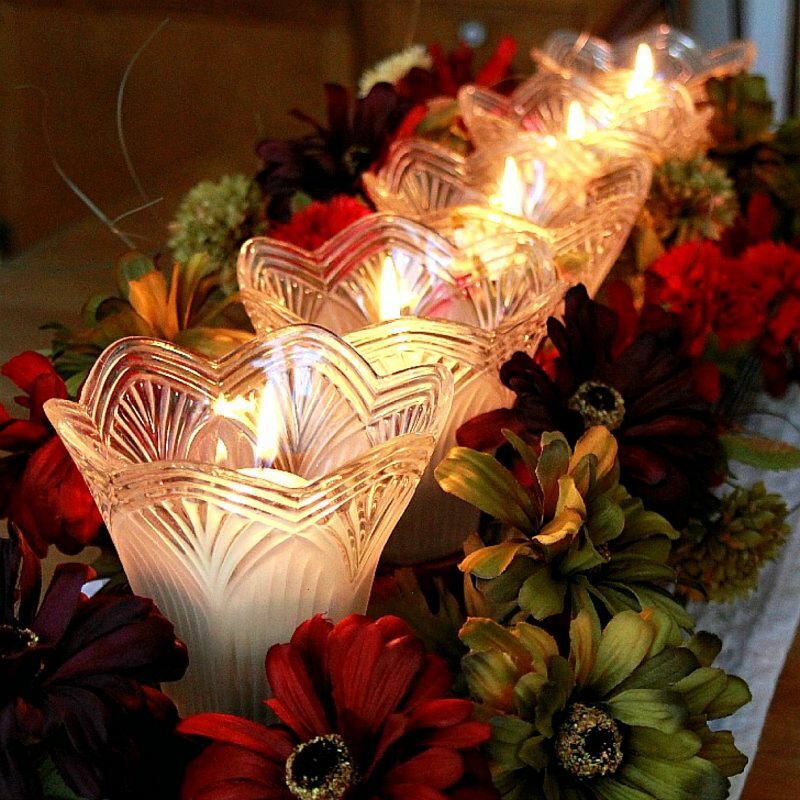 A centerpiece that adds the ambiance of candlelight and is versatile for many occasions. Simply by adding some autumn faux flowers and tucking in a few hydrangea from my garden, I have a pretty arrangement for our Thanksgiving table. 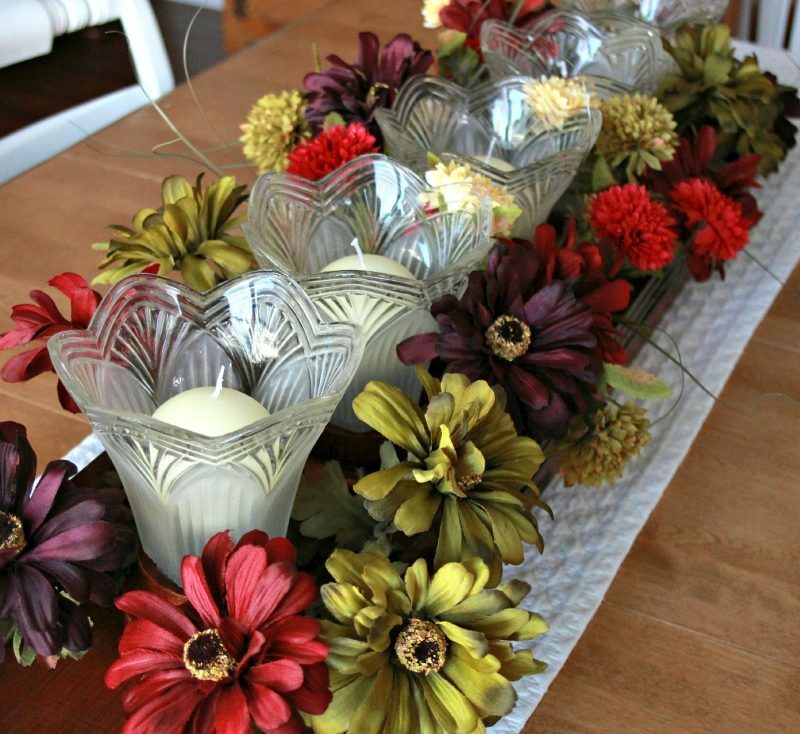 Changing the flowers gives your centerpiece a whole new look. I wash, dry and save faux flowers in a container in the garage using them year-after-year. If you need to purchase faux flower bushes, remember to use your coupon if they are not on sale. I like to purchase flower bushes and cut them apart so I can tuck the stems in and around the glass globes. Individual flower or greenery picks work well too. This wintry arrangement went trough the Christmas season into January. It looked lovely for a lunch I hosted for friends to brighten a sometimes dreary month. The lunch theme was WHITE for snow, and the centerpiece worked well. Take a peek at the table and the menu by clicking Winter’s White Lunch. You can imagine just how many ways there are to change the look of your table simple by changing the flowers or greenery in the centerpiece. But the centerpiece looks great all by itself without the addition of flowers. 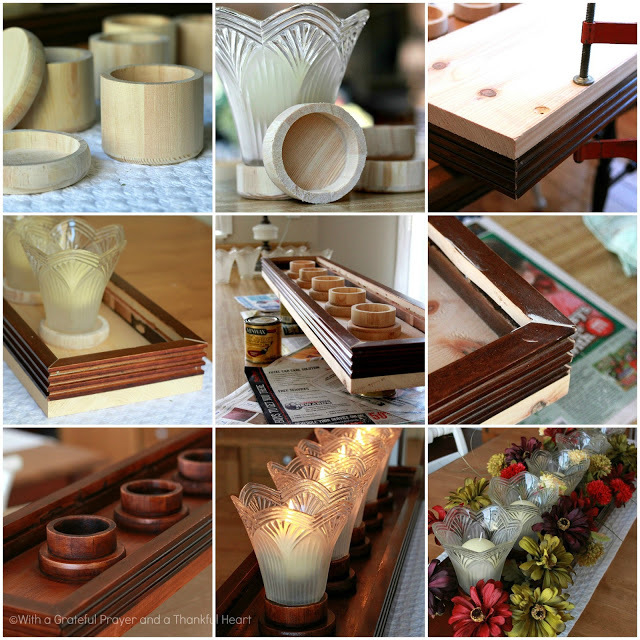 The candles and the wood shine with a clean, streamlined look. Best of all, it was built using re-purposed glass globes from an old chandelier, wood salvaged from a large television cabinet we no longer needed, and the purchase of just a few other supplies. These are the wooden boxes we used but I don’t think they are available now. You might want to try using wooden rings. Use one or two of them depending on how high you want the globe to sit. 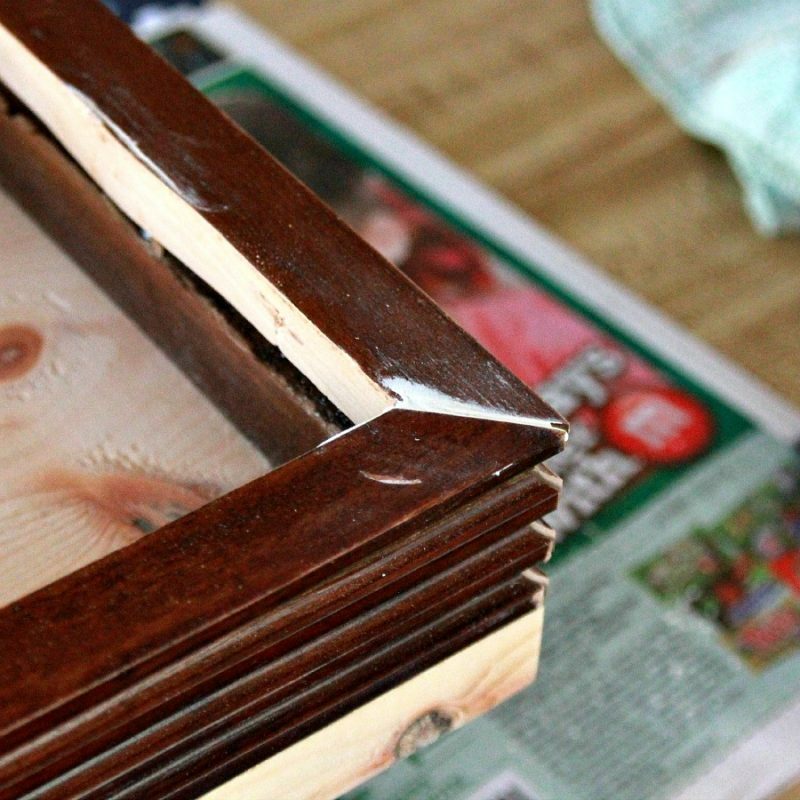 After making a frame from salvaged wood, another piece of wood was attached for the bottom. The rings were attached that would become the holders for the globes. The holes and gaps were filled and the piece was sanded. Stain to match the trim wood was applied and allowed to dry. Then a coat of polyurethane was brushed on. This is how we went about making the centerpiece using materials and supplies we already had. Use this as a guide and change it up as you see fit. I had six glass globes and considered making a three-candle centerpiece for the kitchen table. 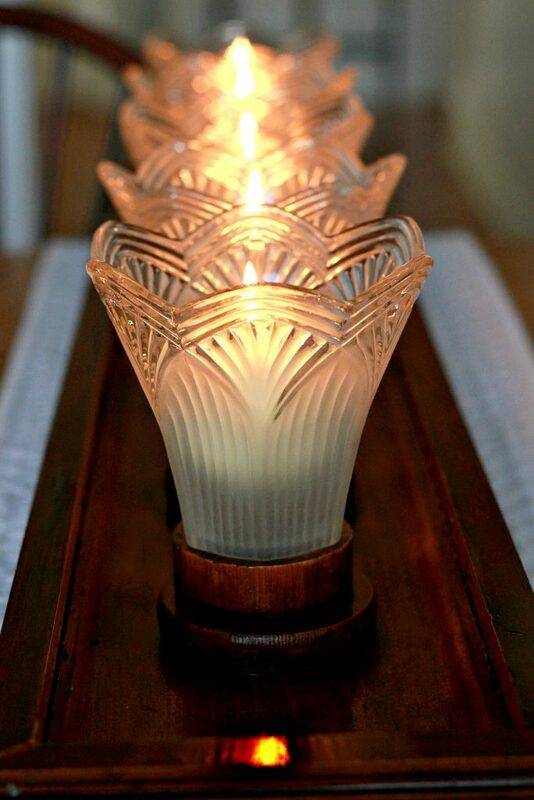 Instead we made a five-candle one that can also be used on the family room coffee table and the dining room table. The glass globes are open on the bottom. 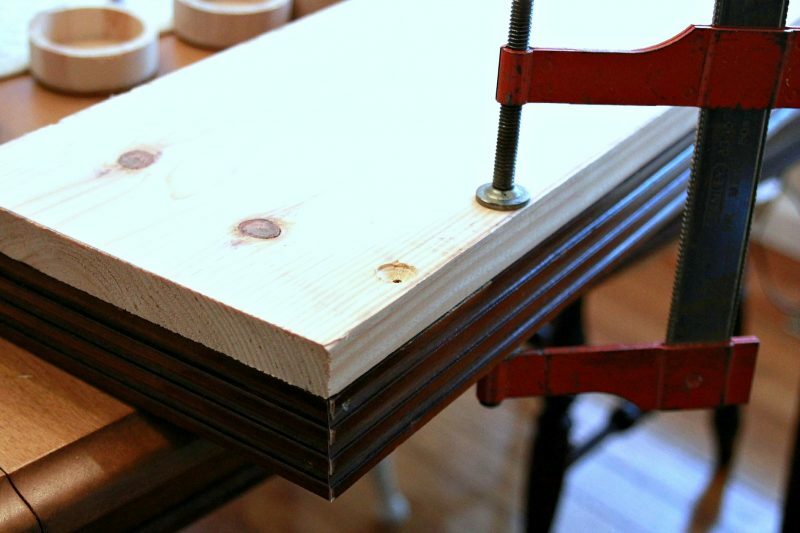 We could have just glued them onto the wood but I wanted something to raise them up a bit and hold them securely. 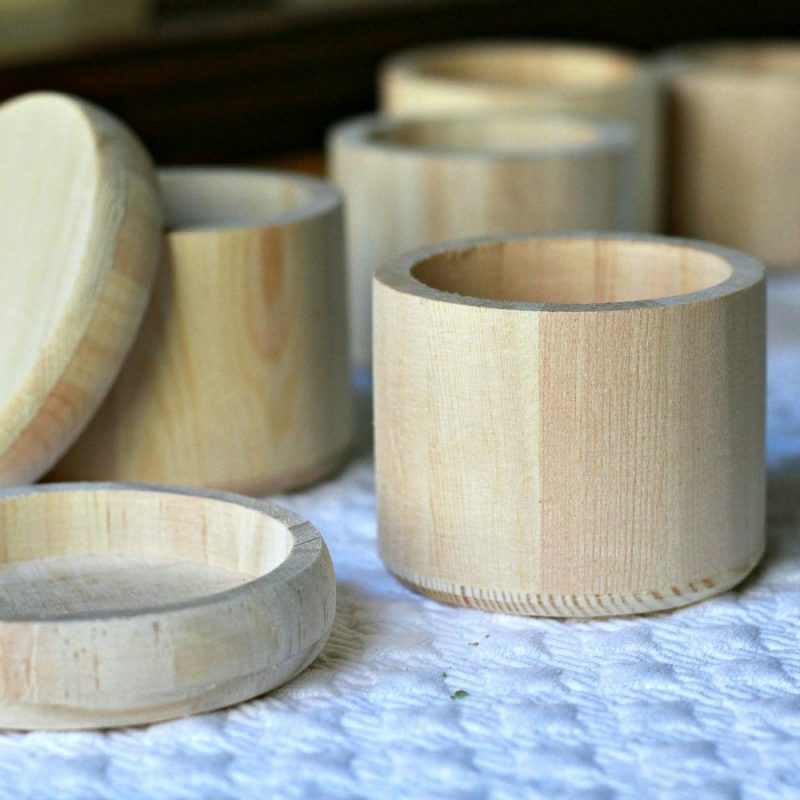 I looked for some type of ring and found just the right size wooden round boxes at the craft store for $1 each. I thought about using only the bottom but decided to invert the lid and cut down the other piece to our desired height. This wooden ring is a possible option to consider. Using some fancy trim we salvaged from an old cherry television cabinet, we made a long, rectangular frame. We cut and screwed a piece of wool to the bottom of the frame. 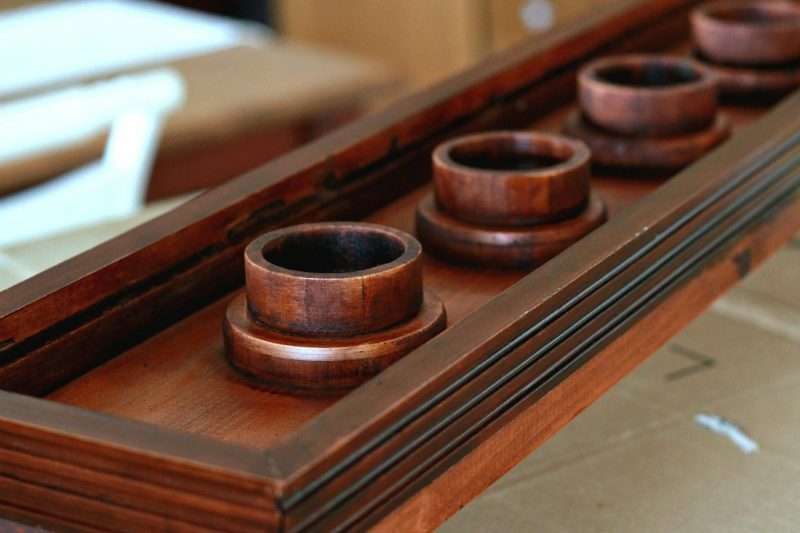 The wooden cups were also screwed into place. 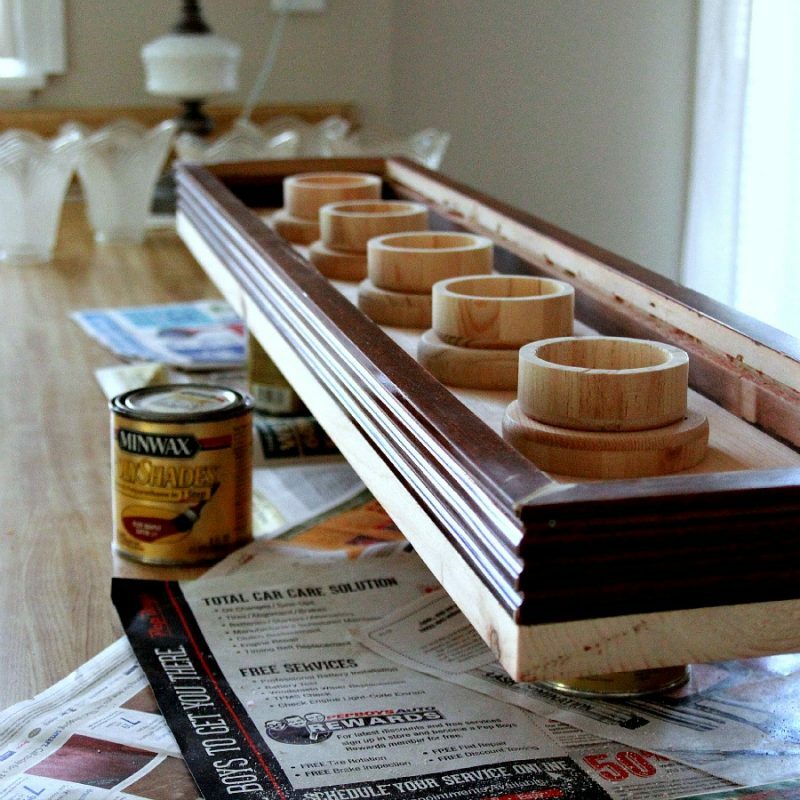 After filling any gaps/holes with wood filler and sanding the piece, I gave it a coat of stain. A day later it was ready for a coat of polyurethane to finish. The globes fit nicely inside the cups and each one holds a round-shaped candle. Have more glass globes and rather not make a centerpiece? 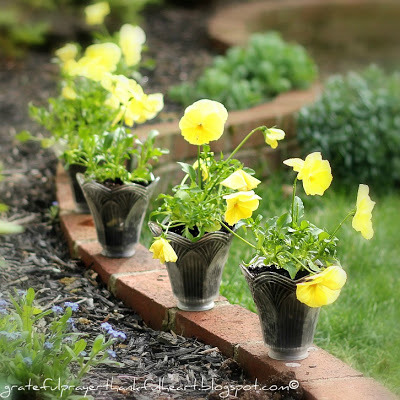 Try super easy, super cute flower pots. Click Simple re-purposing for pics and how-to. This is very pretty. What a great idea. I remember reading this before and saw my comment. But this time I thought you were talking about globes–world globes! They are quite popular in decorating now I think! But I enjoyed seeing your creativity again. 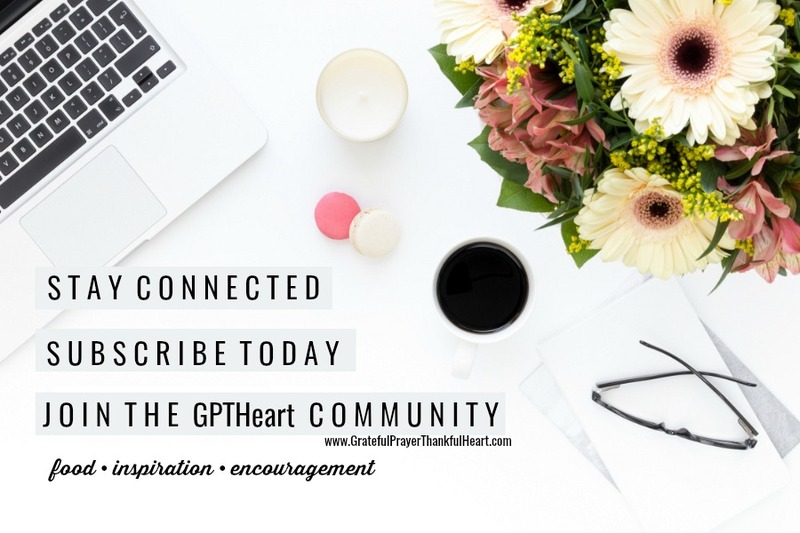 I had not been by to visit in a while but this morning, I got up early, fixed my coffee with my peppermint mocha and started reading some of my favorite blogs. Your blog was the first! I had to catch up. This is a beautiful project. I remember you using the globes for little flower pots. They are so lovely on your table. I enjoy your blog so, so, so much. That is so pretty! You're so creative!! You are brilliant! I feel like I should pay for this class I just had today:) What a great idea and how you did it all made a perfectly lovely centerpiece! Thank you for taking the time to share it with us. I remember thinking the globes looked so nice with the outdoor version you made, and now this is even better! What a beautiful way to repurpose these antique lamps. 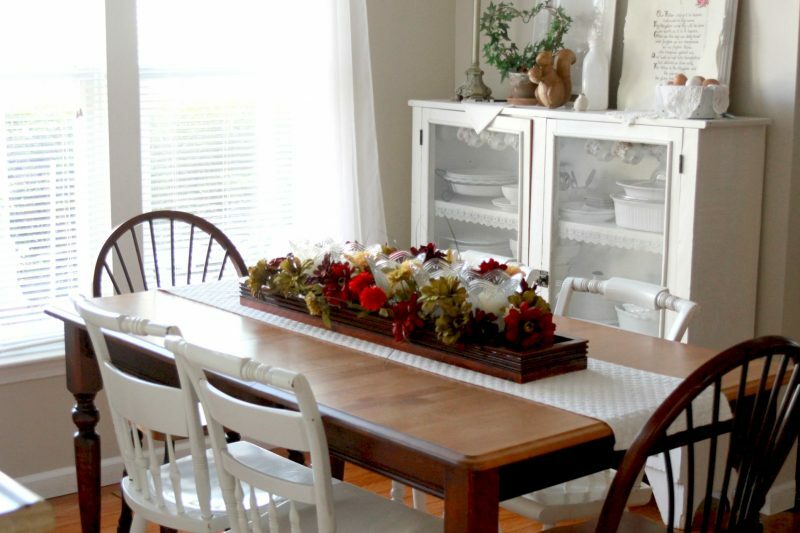 I so enjoy the idea of reusing things in a classy and lovely way. Very pretty! 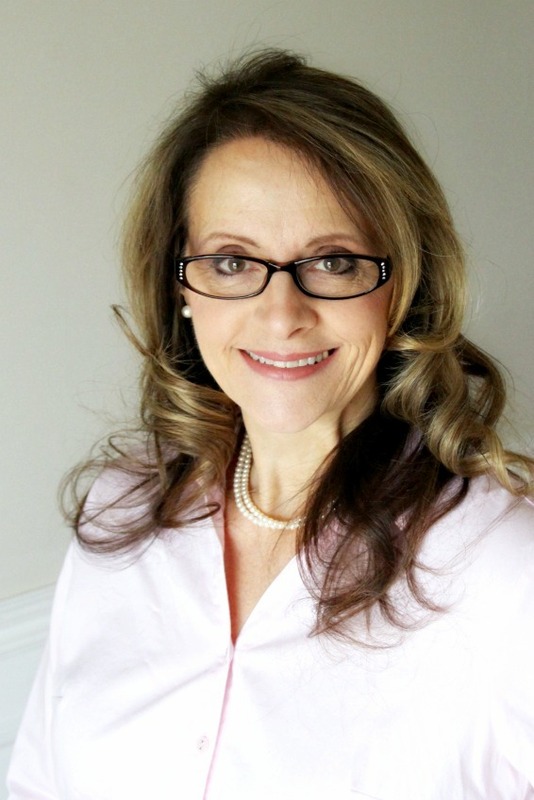 Simply beautiful Lorraine. Another one I pinned to Pinterest. That looks beautiful. What a clever idea. I'd like to try something like that for my advent candles. 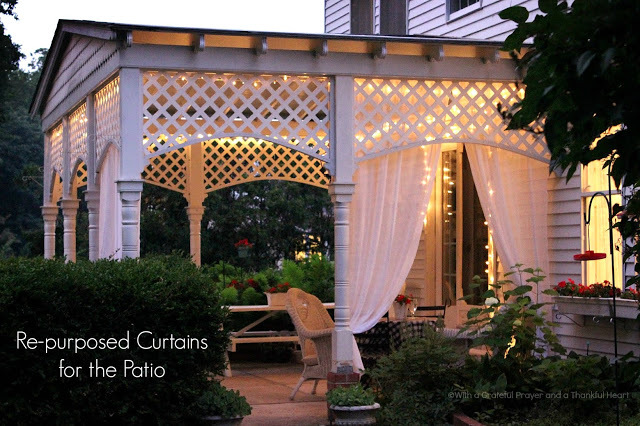 That's so pretty–what a great idea! If that's not the cutest and most cleaver idea! Happy Thanksgiving! Very creative Lorraine…and very pretty too! I can't to see it all dressed up for Christmas! Hope all is well with you and your sweey family. You've been in my prayers. How inspiring! I love a line up of votives but this is much nicer! Great job, and it sounds like you could still use them in a different way since they aren't in permanently. So clever and so charming . . .
Oh, dear Lorraine, These lamps are so beautiful!What a wonderful idea and how beautifully you have done it! Yes I very much remember them as flower pots. And, I missed you all these days! That is a gorgeous centerpiece. I love the way you put it all together. And versatile! Thanks for sharing it with us. Oh. My. Word. What a fantastic idea! Thanks for the inspiration!